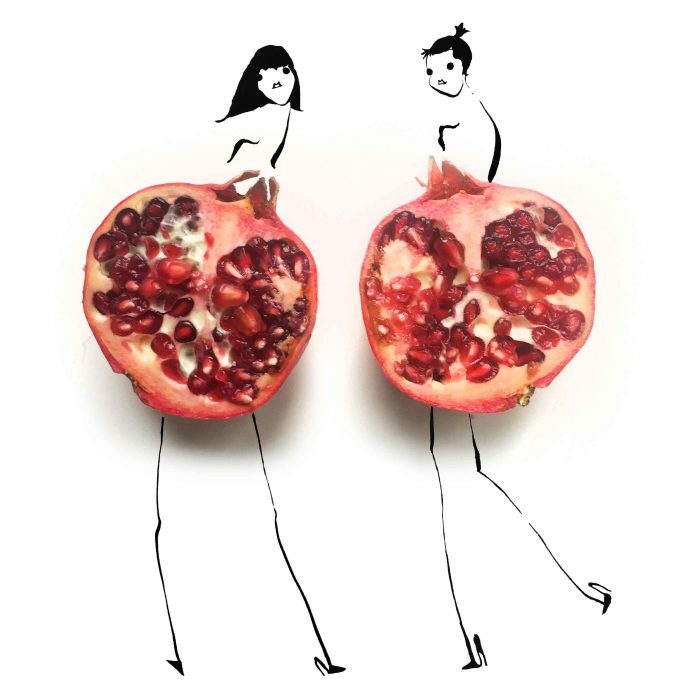 How to recreate Givenchy’s latest dress with kale leaves or turn a banana peel into an adorable monkey, are some of the things we can find in Gretchen Röhers’s Instagram; the illustrator has conquered social media with her fashion compositions created with fruits and vegetables. We spoke with her about her work, her career and how food can be an incessant source of inspiration. SO BLUE: How has the idea of mixing food and fashion through your illustrations come to be? GRETCHEN: It all began when I started sketching my food when at a meeting or at work; when I’m bored, I either eat or draw, so it was bound to happen sooner or later. SB: What is your professional background and why are you influenced by fashion and food? G: I have experience in fashion and product design, which provided me with the ability to draw the human body and its shapes. I also had the opportunity of experimenting with the world of food packaging and accessory design, so everything started to take shape when I began this project. SB: What other projects do you work on? G: My day to day job is developing mobile apps in Silicon Valley. They seem like two very different fields but app design and fashion design are similar in more aspects than you think! SB: What is your inspiration? G: California, where I currently live, is an amazing source of inspiration. The desert, so close and available right in the outskirts of the city, always surprises and stimulates me when creating. I’m also an avid consumer of fashion and current tendencies, for which I try to follow fashion shows and fashion weeks every season. SB: The world of fashion is often considered frivolous, is it possible to have fun with it? G: Fashion is loads of fun! Every day you have the option of reinventing yourself and projecting the new you to the rest of the world by simply wearing a certain coat or pair of trousers you choose. G: I love artichokes and bananas but hate working with asparagus. SB: A very foodie city to be discovered. G: San Francisco, no doubt! You will find any type of cuisine you are looking for there. SB: And a very fashionable one? G: Not San Francisco in this instance! The ideal cities are New York and Los Angeles. SB: Which of your projects can be seen in 2016? G: I’m very excited with the publication of my own book.